Newcastle, England native Tony Grey is no stranger to the Erie Reader or the Erie Art Museum - he played our "New Year's Eve at the Erie Art Museum" event last year, and can be seen in our area - at Romolo's and PACA, among other places - quite often, either solo or as part of a group. 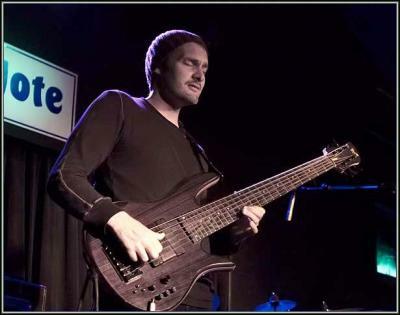 This Sunday, he'll appear at the Blues and Jazz Festival as part of a trio, with Berklee roomie Romain Collin on piano and James Johnson drums. Cory Vaillancourt: Tell me your life story in less than 30 seconds. Tony Grey: I was in the [British] Army, was injured, and was given a bass guitar as a means of therapy, you know, to overcome the trauma of it all. From there, John McLaughlin heard me play, and I packed my bags for the States. CV: Tell me about the first time you picked up that bass. TG: I was kind of a little bit proud, and I didn't want to admit that I needed help; but as soon as I started playing it, I got a sense of peace. CV: How did your time at Berklee [College of Music] influence your playing? Erie is such a small town, but a small town with a big music scene. People are enthusiastic and open to it. TG: When I first went to Berklee, I was only playing for about 8 months, so my first experience was intimidation. I was surrounded by greats, so I was scared to death. I locked myself in my dorm room for 10 hours a day, every day. It was unhealthy; I always felt that I had to catch up with everybody else. There's so much to learn in music, once you sit down with it, it unfolds like a whole adventure, but once you respect the music, and give to the music, the music will respect you and give back to you. CV: You also teach. Let's cut the crap – what's the secret? What is the essence of playing bass? TG: Being aware of everything around you, being aware that in order to play well – especially bass, because we have a functional role where we support other musicians – you have to be aware of others. CV: You play gigs all across the globe. How does this one compare? TG: I love the idea of it. Erie is such a small town, but a small town with a big music scene. People are enthusiastic and open to it. Tony Grey performs at the Erie Art Museum Blues and Jazz Festival on Sunday, August 4 at 6 p.m. For more information on the lineup, click here.